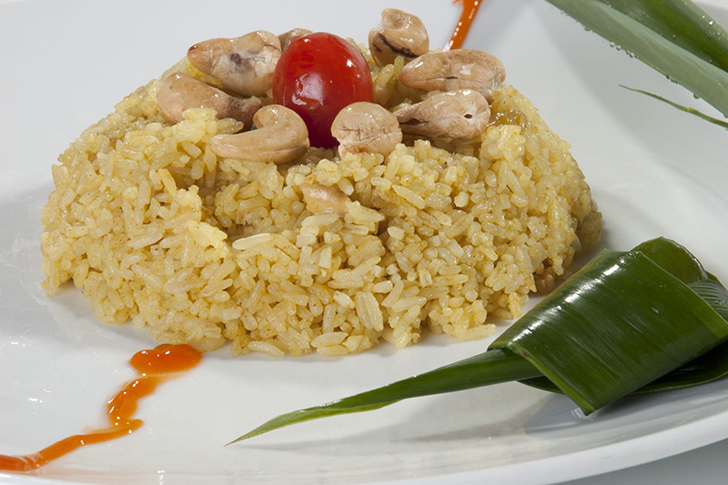 Long time ago, Vietnamese rice has been an important part of the Vietnamese culinary culture. The S-shaped country is divided into three regions of north - central – south with 54 ethnic groups so the rice dishes are also varied according to the culture of each ethnic group. 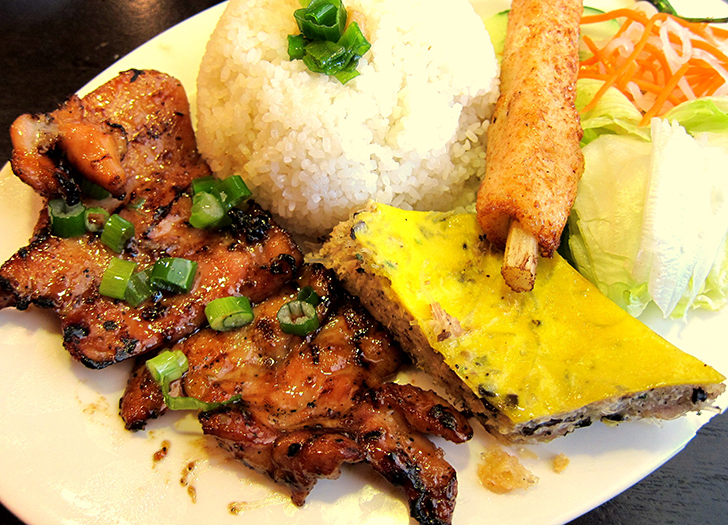 The article below will introduce you some dishes from the Vietnamese rice as follows. Only from the raw materials, rice, Vietnamese people have created a variety of rice fibers with different shapes, sizes, and flavors with unmistakable characteristics. Each type of rice fiber is mixed with local ingredients, broth and spices, creating interesting variations of this kind of food. 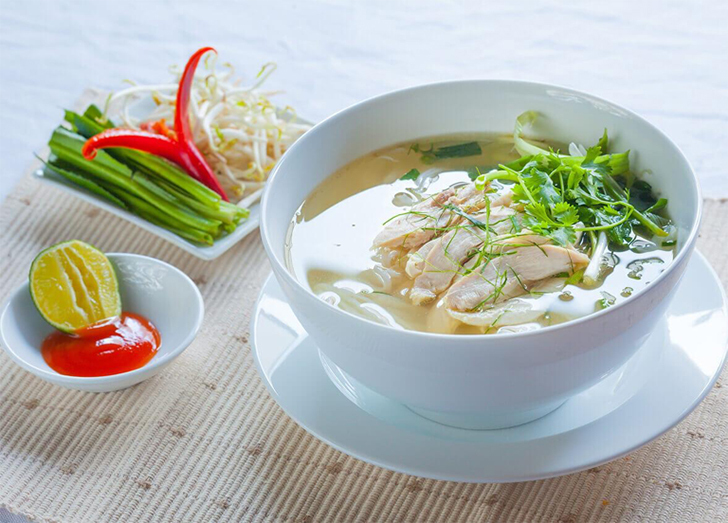 First, it is impossible not to mention Pho – the food is considered the national soul of Vietnam. In order to have delicious rice noodles, we have to choose new rice and then ferment the flour, change the water regularly, and steamed into thin sheets. 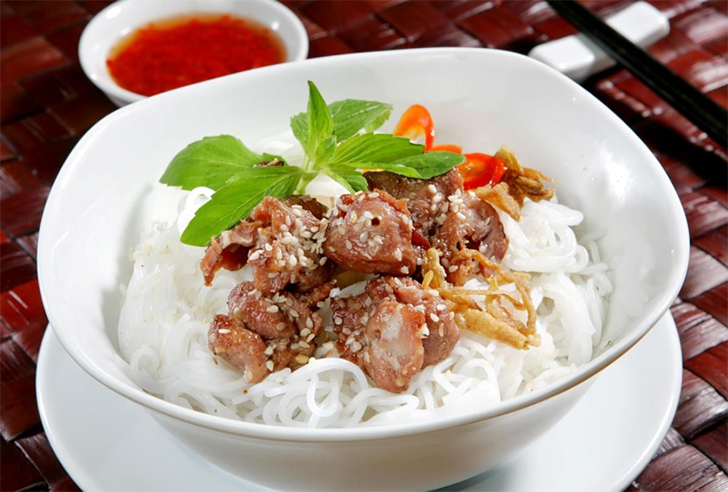 When cooked, the rice noodles are crushed and cut into strands which are white and aromatic with the rice smell. Few can resist the delicious taste of white noodles, red flesh and red chilies in the bowl of "Pho" in the early morning. Meanwhile, the rice noodle is made from rice but has a lot of different flavors and sizes to create variety in Vietnamese cuisine. In the North, there are Bun dau mam tom (Rice noodle with fried tofu and shrimp paste), Bun thang (Hanoi combo noodle soup (chicken, egg, pork & sausage), Bun ngan (Rice noodle with the musk duck), Bun cha (Kebab rice noodles), and Bun moc (Rice noodle with balls of meat)... In the South, the most famous dishes are Bun rieu (Crab paste vermicelli soup) and Bun mam (Vietnamese gumbo). The small-sized noodles are used for all kinds of no-broth dishes and the medium-sized noodles are used for the dishes with the broth. Besides, there are also big-sized noodles for "Hue beef noodle". Besides, another popular variation of rice fiber in the south is "Hu Tieu". The fiber of "Hu Tieu" is small and much longer than Pho and rice noodles. The processing ways of "Hu Tieu" are also very varied. 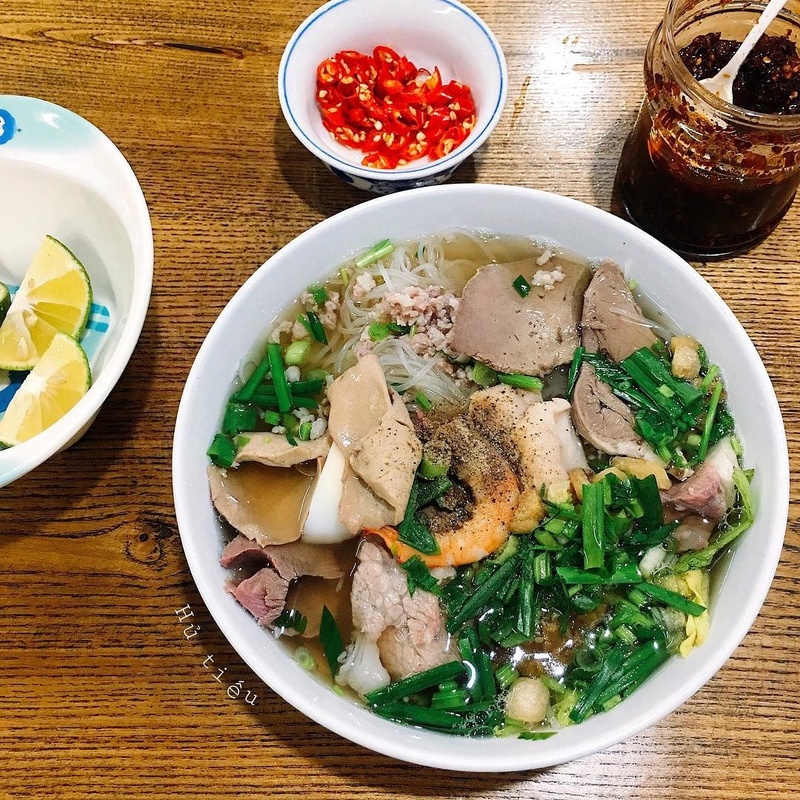 From simple "Hu Tieu", the southern people combined with different types of broth and spices, creating the specific characteristics of each locality such as "Hu Tieu in Sa Dec" and "Hu Tieu in My Tho". This dish is popular throughout the alleys in the South. 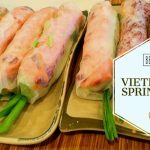 If you are accustomed to white rice or fried rice, you should try to find and taste the following dishes to explore the diversity and richness of Vietnamese cuisine. "Bamboo-tube rice" is not only a familiar dish but also has special spiritual value for people in the uplands. This is the forest dish, processed very elaborately, according to the principles of yin and yang. The rice in the bamboo tube (Wood element) is mixed with the water in the bamboo tube itself or from the stream (Water element), cooked by small fire (Fire element) on the ground (Earth element). Bamboo-tube rice has the smell of the rice and the bamboo, the natural sweetness, and often served with sesame or peanut salt. This is a traditional "Cham food". 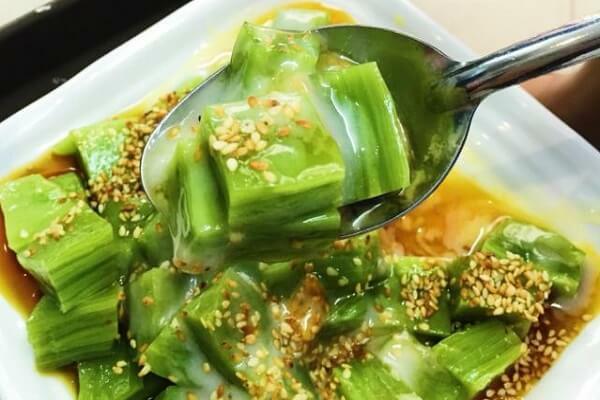 The combination of the yellow curd of turmeric, the aroma of curry, the characteristic of the leaves, and the sweetness of shrimp and squid is very attractive to make anyone who has enjoyed even once cannot forget. "Cham people" eat rice with curry (made from beef, curry, chili salted, and coconut milk ... in the style of Cham). Enjoy this rice dish, you will feel the sweetness of milk, the odor of peanuts, the natural sweetness of beef, raisins, and the spiciness of chili which are mixed together. The "Tay ethnic group" grows many sticky rice fields so the main dish here is sticky rice. 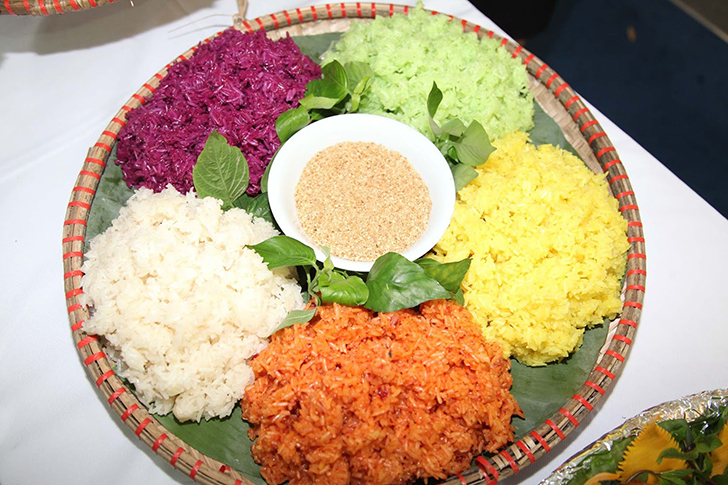 On special occasions, "Tay people" often make the steamed sticky rice in five colors - one of their most distinctive dishes. 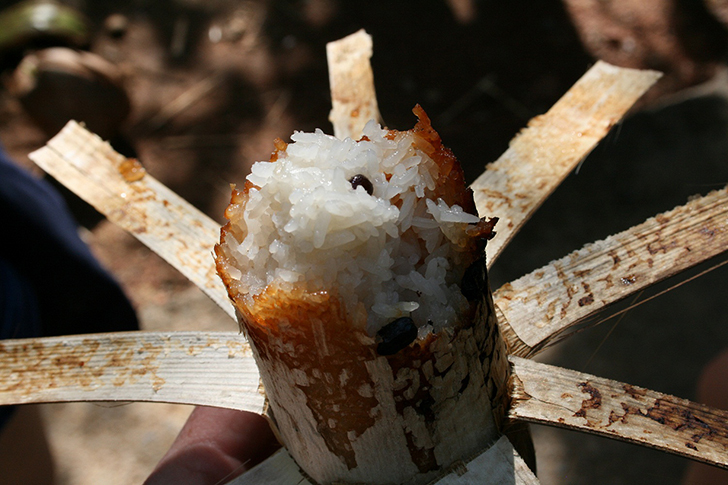 The sticky rice is processed quite elaborately. The coloring materials are derived from plants that are soaked with rice to have five colors: white, red, purple, blue, and yellow. 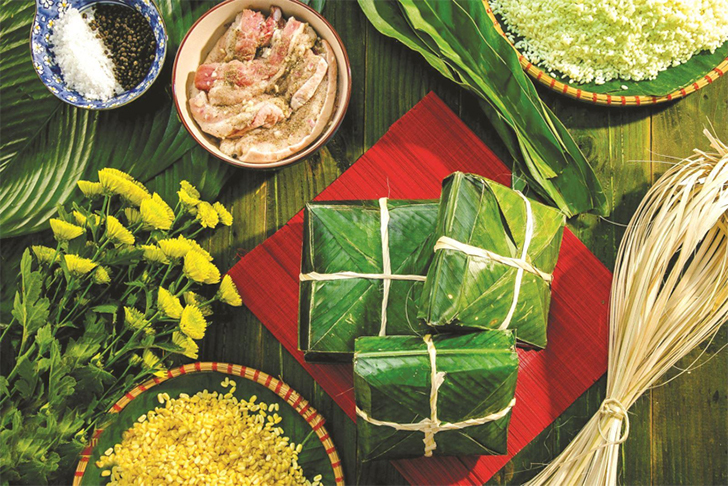 After being wrapped with forest leaves, the steamed sticky rice has the delicious and sweet taste of rice, increasing the warm atmosphere when welcoming visitors. Com Tam or the broken rice, a simple dish of the South, especially in Hochiminh City. An ideal plate of "Com Tam" must include the dry rice (the rice seeds are not stunk together). The ingredients for this dish are rich, including roasted ribs, eggs, sausage, and caramelized pork. The fish sauce is cooked with sugar and cold water in a certain proportion. When spotted on rice plate, the sauce easily permeates each grain of rice and the meat. Adding a little bit of carrot or turnip is enough to make the dish become more tasty and delicious. It is a kind of rice cake made from plain rice without wrapping. Plain rice cakes are found in many varieties such as peanut plain rice cake, coconut plain rice cake, plain rice cake with green papaya salad and pandan plain rice cake. Each type is processed and eaten in a different way but all of them are very delicious and bring a very special taste. Pandan plain rice cake is as green as the jade, cut into long pieces and put into the plate, added the coconut milk, next to the cup of sugar and roasted peanut or sesame. 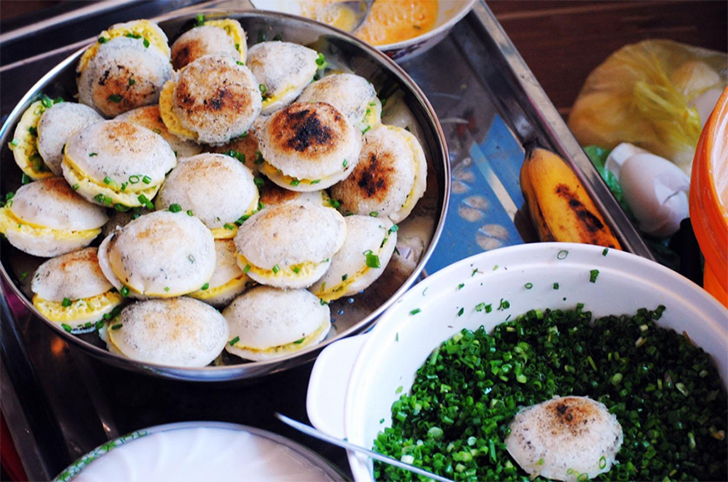 "Banh can" is a popular cake in the South Central region, especially in Khanh Hoa, Ninh Thuan, and Binh Thuan. Banh Can usually has special castings which are made of terracotta and multiple round holes to place the mold. The core of the cake is the spring onion oil or egg. The dipping sauce is usually diluted with fish sauce, garlic, and chili. When eating, the diners will dip the cakes and raw vegetables into the sauce. The sauce can be added to the sausage or spring onion oil to strengthen the flavor. The aroma of rice dumplings is mixed with the flavors of shrimp, meat, and green beans with the freshness of the bean sprout served with raw vegetables. The pancakes in the Northern, Central and South have their own variations depending on the region, but in general, the taste of pancakes is always attractive not only for the indigenous people but also for many visitors coming to Vietnam. Originated from the Central, it is a simple and attractive cake. 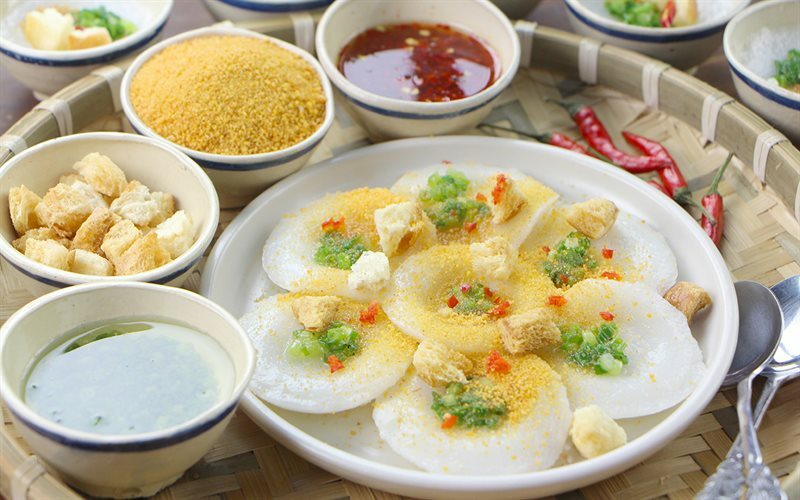 "Banh beo" is usually divided into two types: Banh beo in Quang Nam and Banh beo in Hue. In the Southern, Banh beo is often added with green peas and pickles. Sometimes it is eaten with the plain rice cake and clear dumplings. Banh chung is often seen in the Vietnamese New Year (Tet Holiday) as a spiritual dish made from rice, offering many kinds of meanings. Banh Chung is made from sticky rice, green peas, and pork. Banh Chung has a square shape and green color which is the symbol of the earth. Banh Chung also contains the philosophy of yin and yang not known by many people. In Tet holiday, people will offer their guests with a special treat for welcoming a new year and Chung Cake is a very important part of it. Here are the dishes made from Vietnamese rice which are typical for the culinary culture of this country. 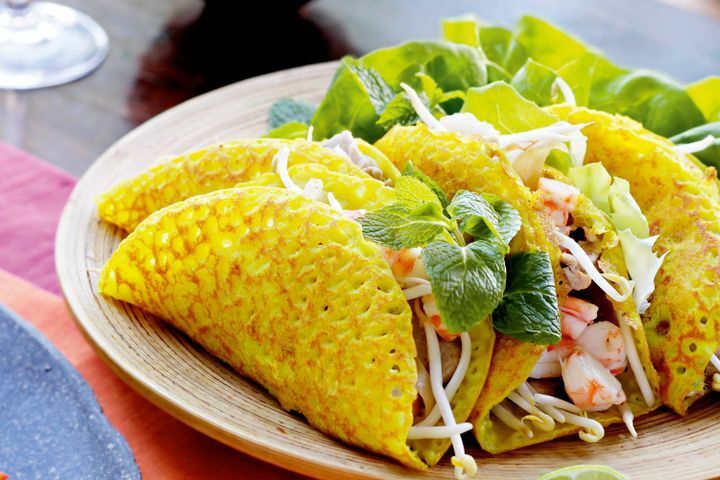 Discovering Vietnamese cuisine will surely bring you a lot of exciting experiences!